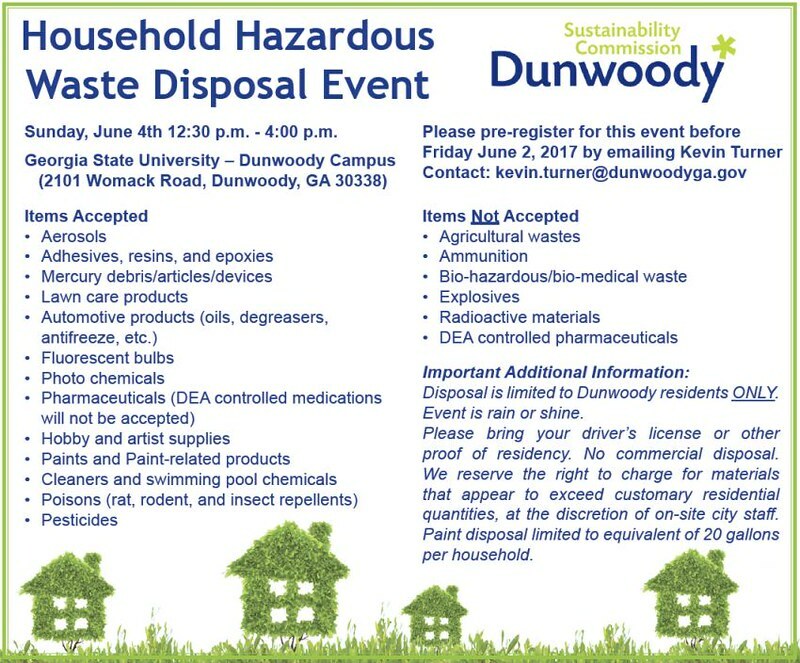 City of Dunwoody hosts Household Hazardous Waste Event on Sunday June 4th - registration required by Friday. WHEN: Sunday, June 4, 2017 (12:30 p.m. - 4:00 p.m.) Event is rain or shine. This is the 2nd year for The Fast and the Furriest 5K. This event is for runners, walkers, and their dogs! We are excited to offer a 5K race and 5K walk for athletes, beginners and kids alike, while raising money to save lives! 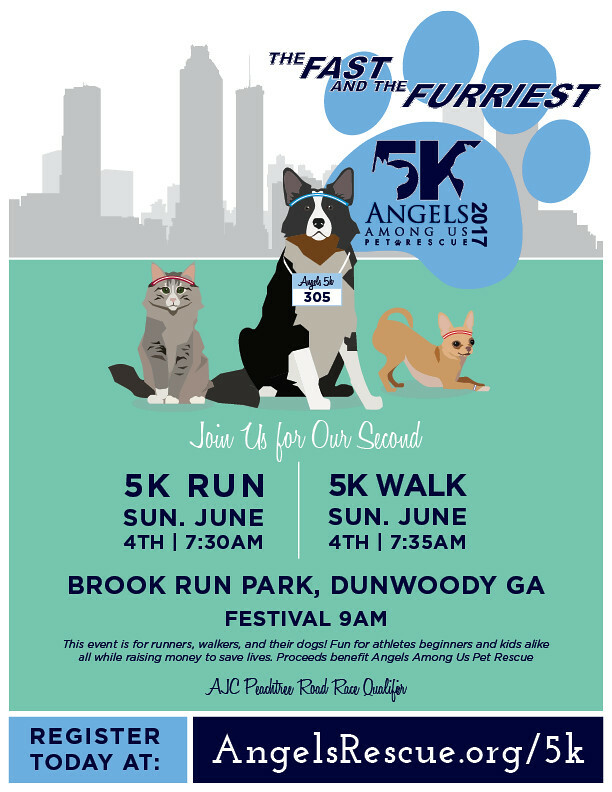 The Fast and the Furriest 5K and Festival, benefiting Angels Among Us Pet Rescue, will be held at the Large Pavilion at Brook Run Park, 4770 N. Peachtree Rd, Dunwoody, GA.
As a USATF certified 5k course(TBD), this race is a Peachtree Road Race Qualifier. The course is flat and fast – a great opportunity to PR! This race will utilize CHIP TIMING! The course will have one aid & water station along the route for runners, walkers and their dogs. Included for each competitor is a custom race t-shirt (guaranteed if registered by May 27, 2017), a goody bag with treats for both owners and dogs, and post-race snacks. The Fast and the Furriest 5K is perfect for both runners and walkers, who want to make a difference in the lives of homeless dogs and cats in North Georgia. AWARDS - Male and Female Overall, Male and Female Masters and top three places in various following age groups. 9:00 am– Festival open to the public!! Packet pick-up will be available on race day beginning at 6:45 am. 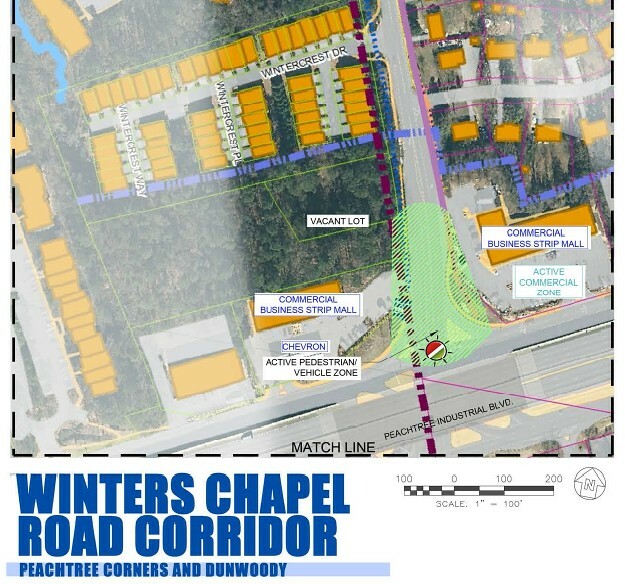 City of Peachtree Corners calls Town Hall meeting for Tonight to discuss improvements planned for Winters Chapel Rd. City of Peachtree Corners hosting a Town Hall meeting on Tuesday, May 23 at 7:00 p.m. at Winters Chapel United Methodist Church, 5105 Winters Chapel Road. “The Peachtree Corners mayor and council members, as well as other elected officials with common jurisdiction, will be in attendance to inform citizens of key matters impacting our community,” said Councilmember Sadd. The Town Hall meeting will be held in Peachtree Corners District 1, and is open to all citizens. 2nd Annual Wildcat Classic Golf Tournament. at Rivermont Golf Club in Johns Creek GA.
Get ready to enjoy another beautiful day of Golf, Beverages, Birdies and Fellowship as we take another big step in putting the Wildcats back on the field Stronger, Faster and most importantly as a united team! The 2016 inaugural Wildcat Cup was a huge success. While we didn't give away the $10,000 HOLE-IN-ONE prize we did provide many other prizes. Some of the highly sought after auction items were: "Coach for a Game" and "Homecoming coin Toss". Perhaps one of best prizes of the day was what the winner of the 50/50 raffle did with his over $900 winnings??? Don't miss this exciting event. You can't imagine how much your presence adds significantly to its success and ultimately the entire program. The only level of involvement that is too small is no involvement. Thanks so much for your attendance and we look forward to seeing you June 6th. Dunwoody Wildcats Football is a growing athletic presence at Dunwoody High school. Wildcat football has had a rich tradition in the football program over the years. With a recent revitalization, the Wildcats are experiencing amazing growth. In 2015 there were only 17 registered players! Excitement has grown and now for the upcoming 2017 season we are looking at over 100 student athletes. Dunwoody High school excels in providing world-class academics to its students and with your help can provide further support in their athletic involvement. We look forward to the future and to growing a well-rounded student that is not just excellent academically, but a talented athlete as well. Dunwoody Wildcats need your support for this growing and dynamic team. As the Wildcats move up in classification we need to stay competitive in our resources and offer the best for our existing and future athletes. Your support will give athletes the opportunity to further their character and enhance their physical talents and work ethics. Your sponsorship and donations to this event will help facilitate training camps, enhance a completely outdated locker room and new athletic facilities, as well as general needs the program will face during this exciting growth period. 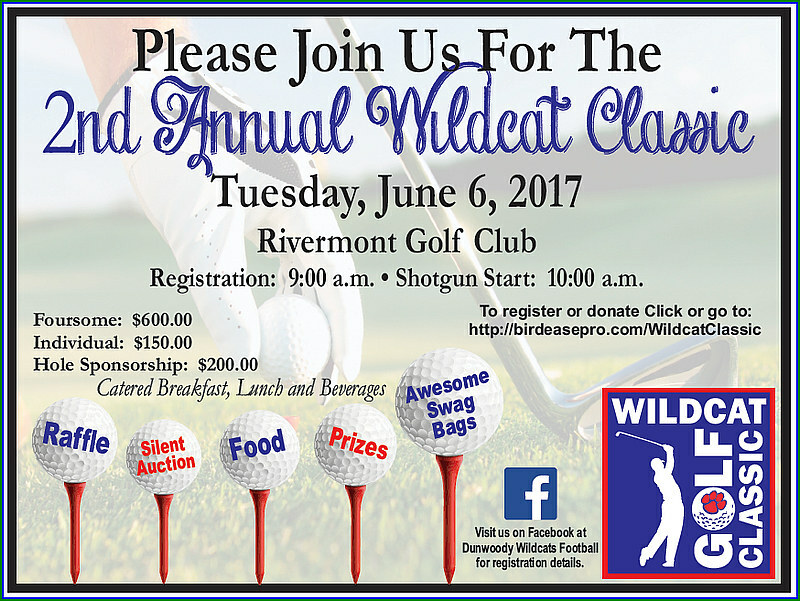 The Wildcat Classic is a fun-filled day of golfing and fellowship. Last year we had 80 golfers and raised nearly $14,000. This year looks to be just as exciting. We will start the day with breakfast before hitting the greens. Coach Nash will be making his way through the course offering encouragement and thanking you for your support. The event will also include a silent auction, raffle and swag bags. Thank you for your donations and support! Help us grow "the Wildcat Way.. with Wildcat Pride!" Proclamation - Georgia State Middle School Science Bowl Champions Peachtree CharterMiddle School -Piranavaskanthan Abeyakaran, Manas Gangwar, Prathmesh Joshi, and Zain Salim. Proclamation - Recognition of Dunwoody High School FIRST Robotics Competition Team, WildCat 5e - Rachel Bick, Lauren Caplan, Noah Covey, Noah Daly, Martin Federico, Will Foster, Nick Gonzalo, Will Granata, Jackson Grant, Cole Griffith, Andrew Hill, Jason Hughes, David Knight, Jackson Kuller, Sawyer Mauldin, Matthew Moussouri, Shreya Nainwal, Cameron Raj, Nathan Stefanik, and Ben Warren. Presentation by Dunwoody High School Youth Council. Recognition of Citizens Police Academy Graduates. Award of RFP 17-05 Request for Proposal Furniture Removal, Storage, and Reinstallation. Permanent Easement Agreement for DeKalb County School District. Ordinance Amending Chapter 4 of the City of Dunwoody Code of Ordinances to Authorize Bring Your Own Beverage for Certain Retail Establishments and Creating a Limited On-Premises Consumption Alcohol License for Certain Businesses Authorizing Same. Ordinance Granting a Hardscape Easement Agreement to Atlanta Office Investment Phase I, L.L.C. Peachtree Industrial Blvd. Access Road - Sidewalks & Multimodal Safety and Access Grant. Chapter 27, Zoning Ordinance Text Amendment re: Chickens. 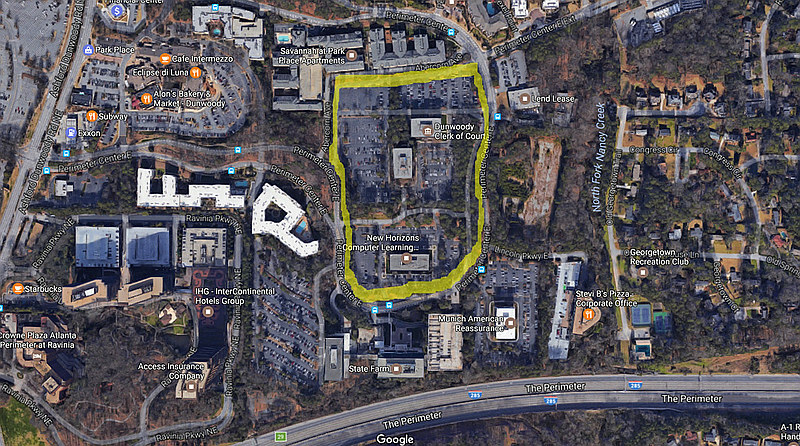 Ordinance to Grant a Hardscape Easement on Perimeter Center Parkway to Atlanta Office Investment. Discussion of ITB 17-02 Construction of Baseball Facilities at Brook Run Park. - Rebid? Contract Amendment for Skyline Engineering and Construction. Ordinance Amending Chapter 27 Zoning to Add the Perimeter Center Overlay and Zoning Districts and to Revise Other Provisions of the Zoning Ordinance. 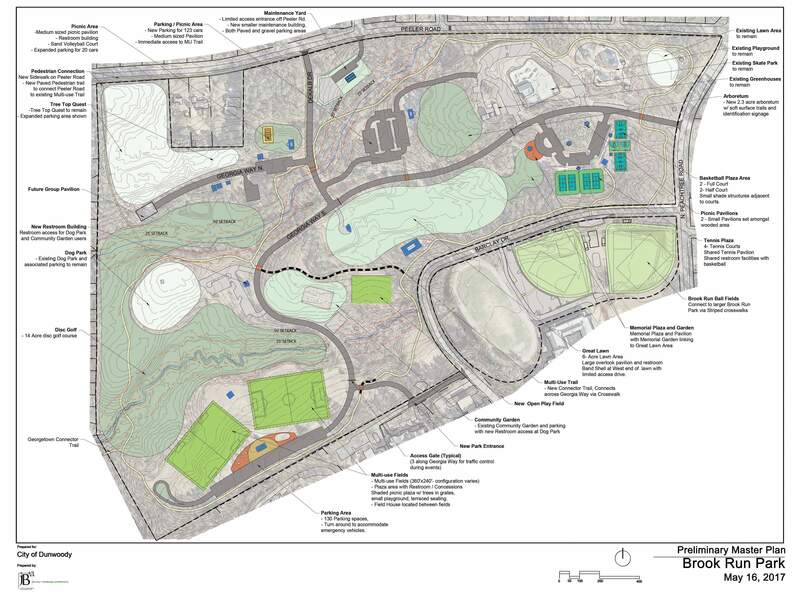 City of Dunwoody releases final design concept for Brook Run Park, adding many amenities - comments welcome. Last night the final design concept of Brook Run Park was released showing two multi-use fields in the back of the park, a new playground near the fields, new concession area with restrooms, parking and a new back gate off Barclay for vehicles so that heavy traffic to the back will not impact the other sections of the park. There is a new restroom between the dog park and community garden, a back pedestrian entrance off Peeler, picnic areas, pavilions, sand volleyball court, nature arboretum, two full & two half court basket courts, four tennis courts, a new picnic area within the trees, new memorial plaza & garden, new trail connections and finally a 6 acre great lawn overlooking a band shell for city concerts. I believe this concept has squeezed everything imaginable into the park, offering something for everyone. Thoughts? Now please tell us what you think of the final design concept for Brook Run Park. The Parks and Recreation Department drafted the Brook Run Park design based on community input gathered during a Jan. 17 public input meeting at St. Patrick's Church and the feedback from the Parks Master Plan community survey. The community was then invited to give initial feedback on the final design concept during a May 16 meeting at City Hall. You may now share your feedback directly to the City online. 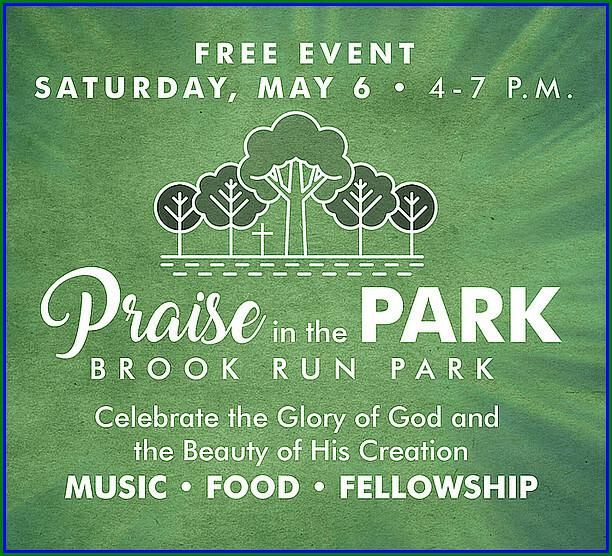 Click on the image above to review the large scale final design concept for Brook Run Park and then provide input. 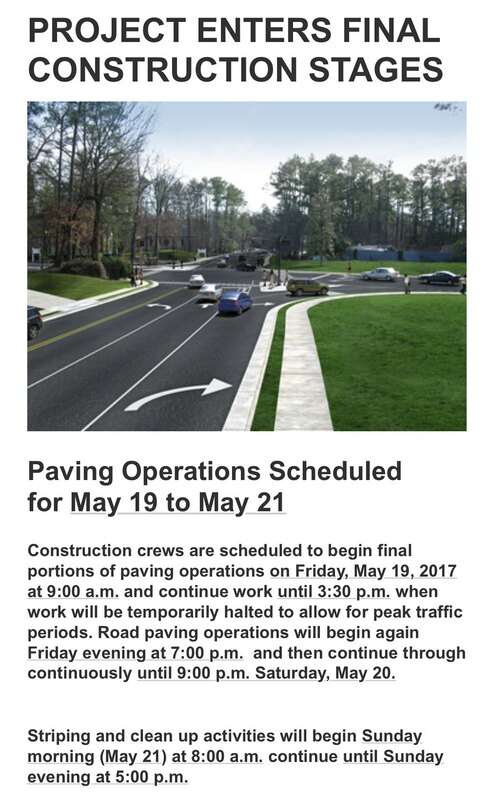 Public input will be accepted online through Wednesday, May 24, at 5 p.m. (EST). Thank you in advance for your valued participation! Dunwoody Art Festival - a Mother’s Day weekend tradition. 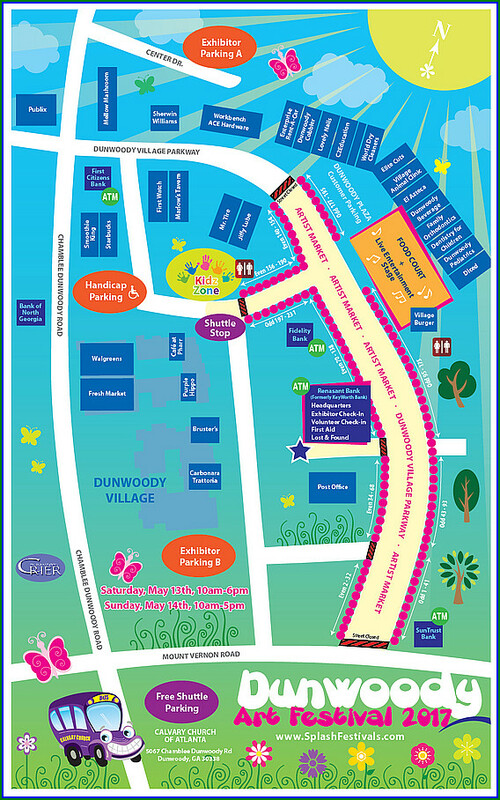 A Mother’s Day tradition in the City of Dunwoody, the crowd-pleasing Dunwoody Art Festival will celebrate its seventh dazzling show on May 13, 2017 from 10AM to 6PM and May 14 from 10AM to 5PM. It's Rain or Shine! In 2016, Dunwoody Art Festival drew a remarkable crowd of more than 40,000 happy grandmothers, moms, children, and of course, lots of dads too! The Dunwoody Village area transforms into a whimsical artist market with fun for the entire family, and Dunwoody Village Parkway will become a shoppers’ paradise. Bestowed the trophy for the “Best New Event of 2010” by the Southeast Festivals and Events Association, Dunwoody Art Festival continues to attract the top artisans from across the country. Along with the partnership of the Dunwoody Crier, incredible community volunteers and the Dunwoody Rotary Club, Dunwoody Art Festival is a must-see! 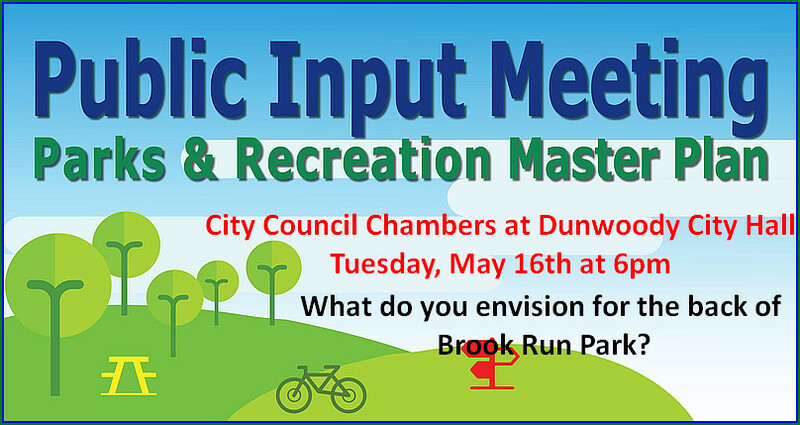 After listening to the community at initial public input meeting held in January, this meeting is an opportunity to view and comment on the final parks master plan concept for Brook Run Park. The meeting will be held at 6:00 p.m. on May 16th in the City Council Chambers at City Hall. Please provide your feedback and input on this the final parks master plan concept for Brook Run Park. The concept will be posted to the city website following the meeting to allow for additional community input. 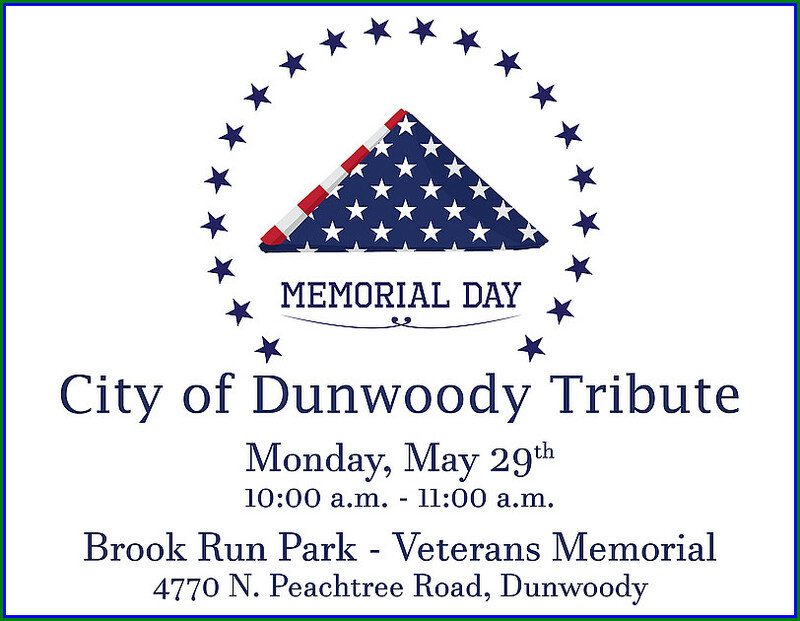 City of Dunwoody releases Parks Survey results. Dunwoody Homeowners Association Board Meeting is tonight, Sunday at 7:30 p.m. The Dunwoody Homeowners Association board meeting is this Sunday, May 7th at 7:30 p.m. in room 4 at the North DeKalb Cultural Arts Center at 5339 Chamblee Dunwoody Road (attached to the Library) and all are invited to attend. Grubb Properties will present their preliminary plans to redevelop the site on Perimeter Center East that currently houses city hall and two other mid-rise buildings. The map below outlines the property they will be talking about. 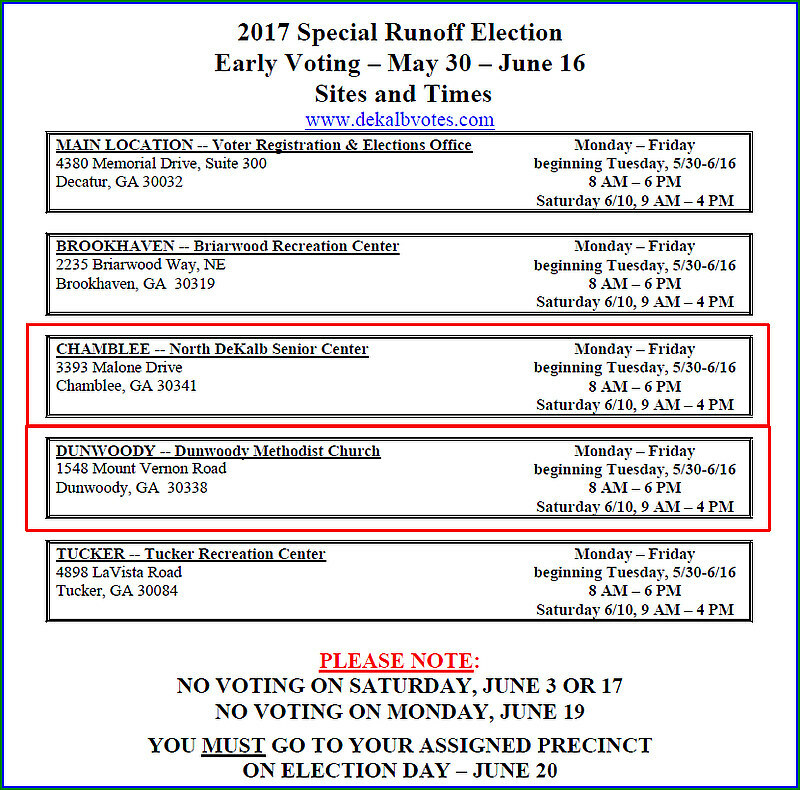 A candidate forum between Karen Handel and Jon Ossoff is tentatively scheduled for May 21st at 2:00 p.m. Stay tuned for additional details as they are finalized. Race with family and friends along this beautiful 5K course to qualify for the Peachtree Road Race and help us raise money for MJCCA programming for children and adults with special needs. Run or walk in our 5K race, or sign up for our 1-Mile Community Walk. All 5K runners will be chip-timed at the beginning and end of the race to ensure accuracy with race results. 2018 AJC Peachtree Road Race Qualifier. Activities before and after the race include music, massages, a visit from the Atlanta Hawks fan experience truck, lots of healthy snacks, and more! I apologize, I guess I should have sent this item out a day or two earlier as I believe it will hit email inboxes after the run is completed. - Sorry. Recognition of Dunwoody High School Robotics Team. YTD Financial Report for March 31, 2017. Presentation of 1st Quarter Internal Audit Report. FIRST READ: Chapter 27, Zoning Ordinance Text Amendment re: Chickens. Approval of a Resolution in Support of a Request for Federal Funding for the Chamblee Dunwoody Road Multimodal Improvement Project (Peeler Road to Vermack Road). Funding Authorization for the North Peachtree Way Culvert Replacement Project. Approval of Unit Price Contracts for Construction Materials Testing, Environmental andGeotechnical Engineering and Testing Services. Authorization to Approve Expenditure of $371,054 to Travelers Property & CasualtyInsurance. FIRST READ: Ordinance Granting DeKalb County School District a Permanent Drainage Easement. Memorandum of Understanding Between the City of Dunwoody and DeKalb County Board of Education. FIRST READ: Ordinance Amending Chapter 4 of the City of Dunwoody Code of Ordinances to Authorize BYOB for Certain Retail Establishments and Creating a Limited On-Premises Consumption Alcohol License for Certain Businesses Authorizing Same. FIRST READ: Ordinance Granting a Hardscape Easement Agreement to Atlanta Office Investment Phase I, L.L.C. My friend Mike Veal puts on a great show, highly recommend. 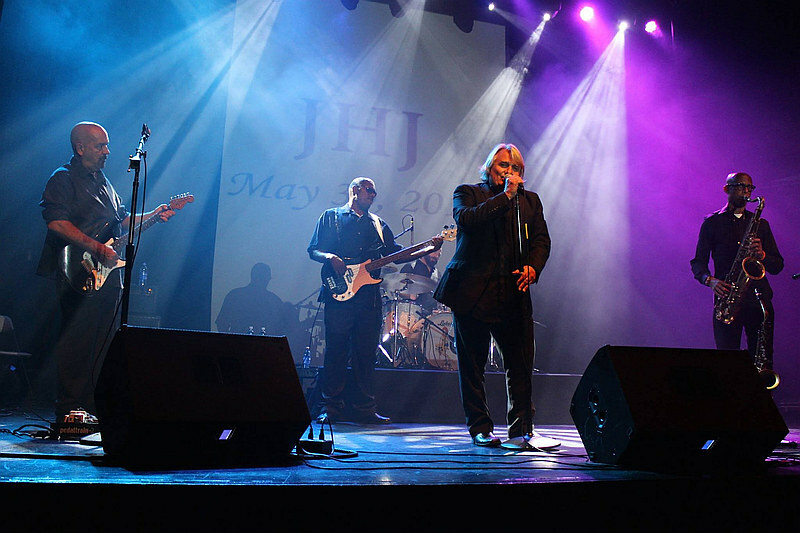 The Summer Concert Series returns to Chamblee on May 6th as we welcome The Mike Veal Band! Join us for our first Saturday concert in downtown Chamblee during which we will also celebrate the Chamblee Charter High School Centennial. Bring your blankets and lawn chairs and enjoy an evening of great music in Downtown Chamblee. The Mike Veal Band plays a hot combination of blues, rock, funk and fun! Diverse musical backgrounds and regional influences color each member's contribution to the tight sound for which the band is loved. You won't want to miss this special performance that will include favorites from different eras and genres of music. Admission is free, and food and beverages (including alcohol) will be available for purchase. Take MARTA or the free Trolley from Chamblee Plaza, and help us kick off the biggest party in Chamblee! Music starts at 6:30 and The Mike Veal Band will perform from 7:00-10:00 p.m.
Born and raised in the heart of the deep south, Lead Vocalist Mike Veal is no stranger to the blues. As a child living in the towns of Milledgeville and Macon in south Georgia, Mike was strongly influenced by area musicians and singers whose lives and songs reflected the true origins of American Blues. As he grew, Veal found himself drawn to the soulful voices of Otis Redding, James Brown and Gregg Allman. Those early influences still strongly color Mike's style today. At 16, Mike started singing professionally with Sansara Show Band, and later worked with Johnny Rivers, and Gary Puckett and the Union Gap. Today, working with long-time friends and bandmates, Mike consistently delivers 110% on stage, believing "you should never do a song you can't lose yourself in". 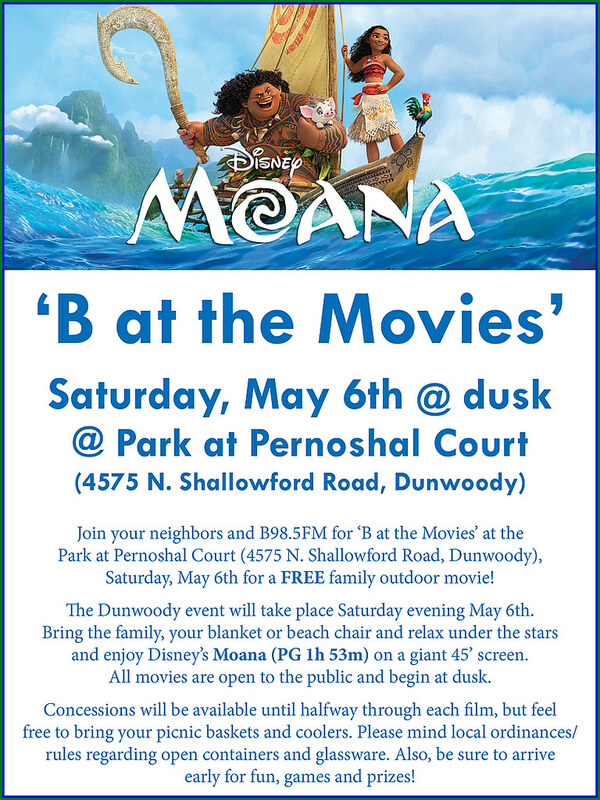 Join your neighbors and B98.5 for B at the Movies at Park at Pernoshal Court (4575 N. Shallowford Road, Dunwoody), Saturday, May 6th for a FREE family outdoor movie! 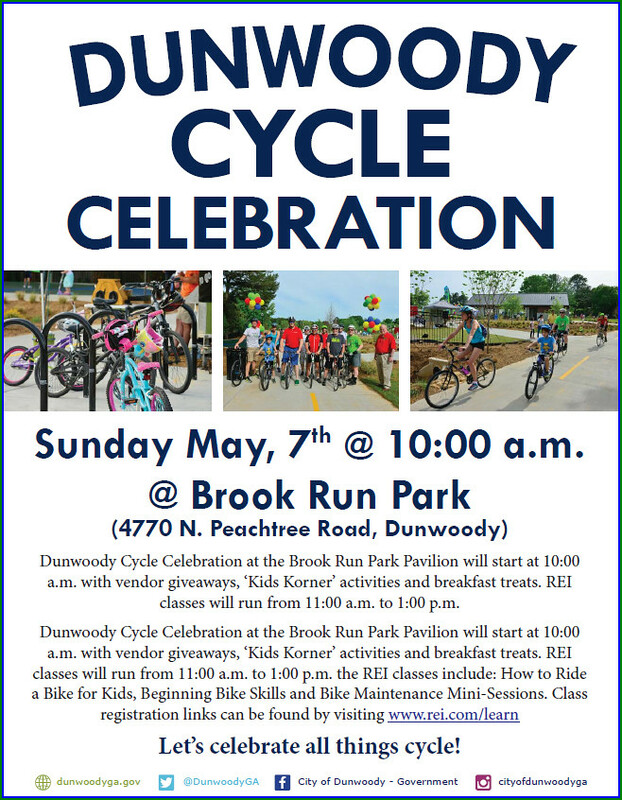 The Dunwoody event will take place Saturday evening May 6th. Bring the family, your blanket or beach chair and relax under the stars and enjoy Disney's Moana (PG) on a giant 45’ screen. All movies are open to the public and begin at dusk. Concessions will be available until halfway through each film, but feel free to bring your picnic baskets and coolers. Please mind local ordinances/rules regarding open containers and glassware. Also, be sure to arrive early for fun, games and prizes! The expanded Summer Concert Series, sponsored by the City of Dunwoody, kicks off Saturday, May 6th with the alternative rock band, Pony League. The Summer Concert Series will run every other Saturday until July 15th. 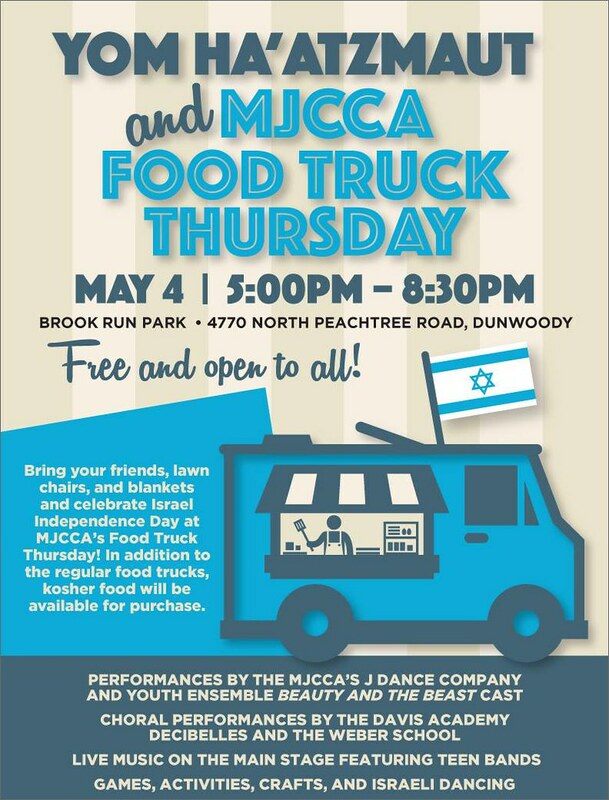 MJCCA night at Dunwoody Food Truck Thursdays is always one of the busiest of the season. Let's just hope there is a sunny gap in the proposed damp forecast. This week Marcus Jewish Community Center of Atlanta - MJCCA is our sponsor and will be providing entertainment and so much more on the field for you while enjoying some of Atlanta's favorite food trucks and specialty Kosher vendors! 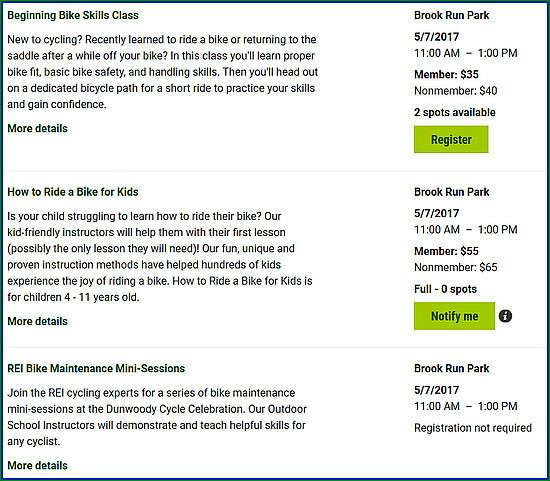 Dunwoody Cycle Celebration @ Brook Run Park - Sun May 7th 10 a.m.
REI offers kids bike riding lessons almost every week at Brook Run! Dunwoody High benefits by CycleGiving fundraising program. Cyclebar, the high-tech spinning studio on Ashford Dunwoody (near Valley View) offers community groups to fundraise through their Cyclegiving program whereby participants donate $25.00 to join a specific sponsored class and all of the funds raised go directly to the community group. On Sunday, I was one of 22 participants who cycled to support the Dunwoody High Girls Soccer team whereby we raised $550.00 for the team in just 50 minutes. The girls picked the music and had a great time while the parents burned numerous calories while trying to keep up with these finely tuned athletes. 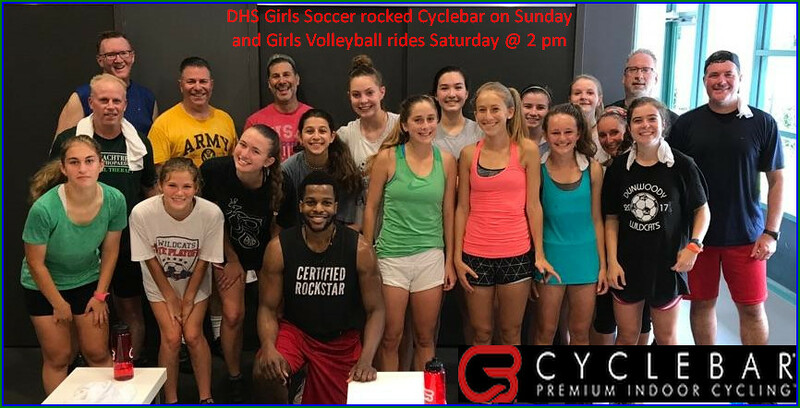 This coming Saturday the DHS Girls Volleyball rides at 2 pm and I've already registered my seat but what this effort really needs is a better cross section (boys) of the entire school to participate. As a semi-regular rider, I highly recommend Cyclebar as an entertaining high-calorie workout (that is also kind to my knees) and hope that the DHS Community fills the room on Saturday. Click the link below to register.